Korail’s newly launched West Gold Train line takes travelers to Gunsan in Jeollabuk-do (North Jeolla Province), one of its seven destinations. 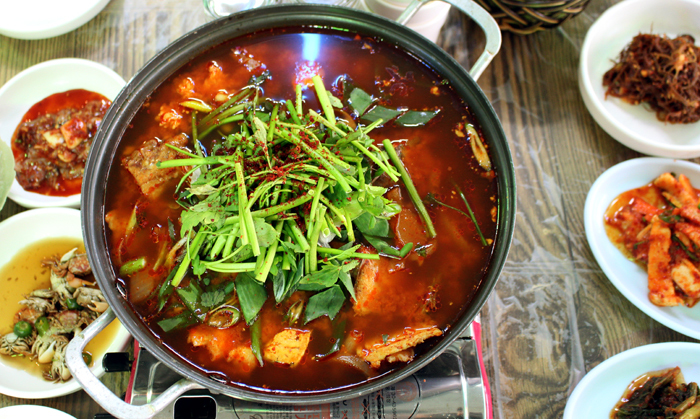 Gunsan is located on the north edge of the Okgubando Peninsula along the West Coast, a jut of land defined by the Geumgang River to the north and the Mangyeonggang River to the south. It is a port city and also covers a group of nearby islands, known as the Gogunsan Islands. A one-hour ferry ride that departs Bieunghang Port leads to the islands, giving the traveler an eye-popping vista of water and nature. 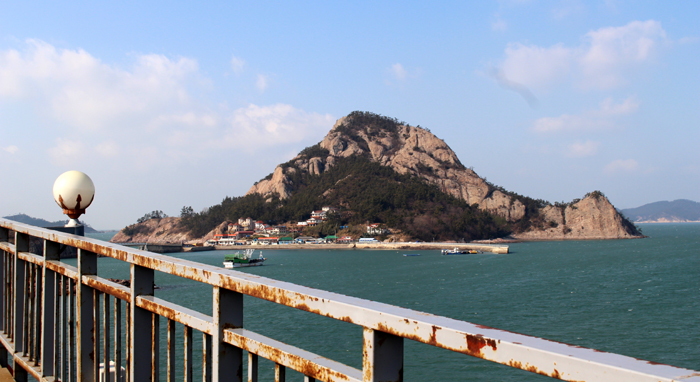 Numerous forested outcrops can be seen from the ferry en route to Seonyudo Island. The ferry departs Bieunghang Port in Gunsan, Jeollabuk-do. The Gogunsan Islands comprise of 63 islands or islets. There are 16 inhabited islands, including Sinsido, Moonyeodo and Jangjado Islands, and then 47 uninhabited islets or rocky outcrops, such as Hoenggyeongdo and Sohoenggyeongdo Islands. The word gunsan (群山) in the name “Gogunsan” means, “a group of mountains,” representing the off-coast islands. During Goryeo times (918-1392), the islands were called Gunsan-jin, which can be translated as, “the Naval Base of Gunsan.” During the reign of King Sejong the Great (r. 1418-1450) in Joseon times (1392-1910), the islands were referred to as Gogunsan, with the word Go added, meaning, “old” (古), as the naval base was relocated inland to what is currently the city of Gunsan. Jutting out in the very middle of the island-cluster is Seonyudo Island. It boasts striking scenery, as if it were part of a landscape painting. 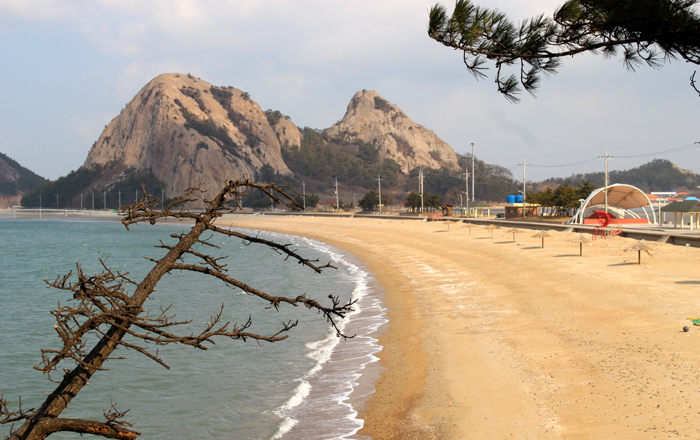 Next to Mangjubong Peak unfolds Myeongsasimni Beach, a heart-shape sliver of sandy shoreline. One of the great sights to be enjoyed here is Mangjubong Peak, a mountain of two rocks, 152 meters high, set against Myeongsasimni Beach, a sandy heart-shaped strip of shoreline at the peak’s base. 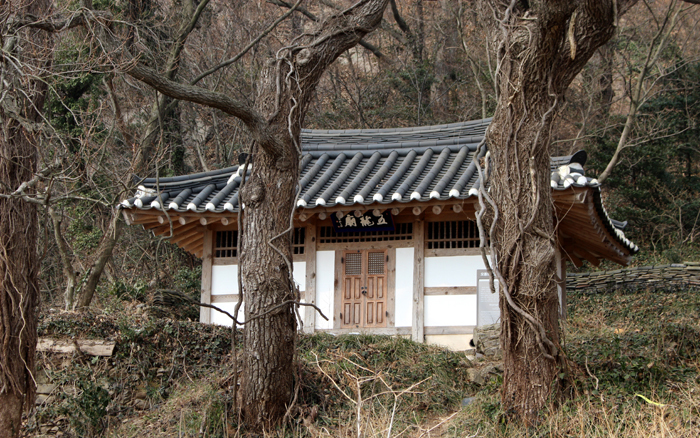 Legend has it that a virtuous scholar — a seonbi — who was exiled to the island would look out to Hanyang, what is today Seoul, from atop the rocky mountain, longing for the king. That’s why the mountain is now called Mangjubong (望主峰). At the Oryongmyo Shrine on Seonyudo Island, off the West Coast of Gunsan in Jeollabuk-do, ships’ crewmen held ritual ceremonies to pray for safety on their voyages. At the foot of the rocky mountain stands the Oryongmyo Shrine (五龍廟). Crewmembers sailing past the coast off the island stopped here and prayed for a safe journey and for a good haul of fish. 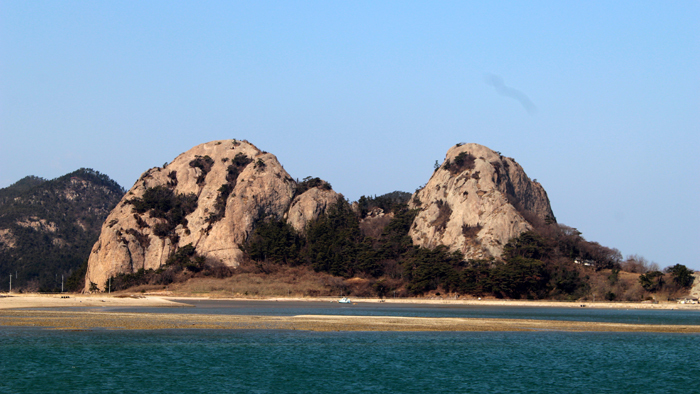 Jangjado Island can be viewed from nearby Seonyudo Island. There are two bridges connecting nearby islands: the Jangjagyo Bridge linking to Jangjado Island and the Seonyu Bridge to Munyeodo Island. The bridges give another great spectacle, allowing travelers to enjoy looking at picturesque views of the beach, ocean and the islands, while strolling along the bridges. The bridges are also visited by many families and couples travelling by bicycle. 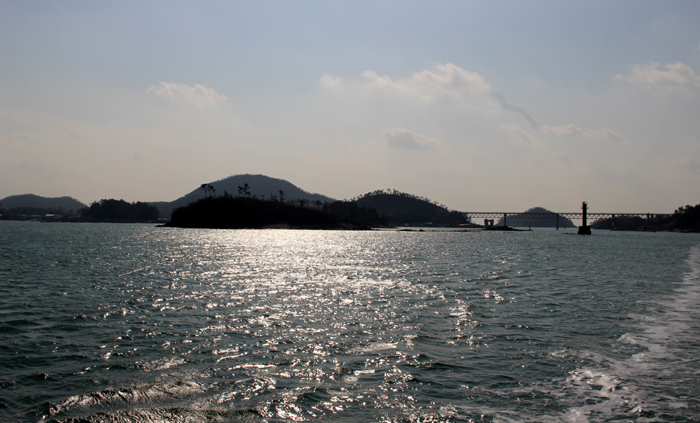 To get to Seonyudo Island, use a ferry from Bieunghang Port in Gunsan. The ferry runs at 1:00 p.m. once a day, as of February 2015. The time or number of ferries is subject to change during peak season. This article was made possible in cooperation with Korail and the tourism promotion department of Gunsan City. 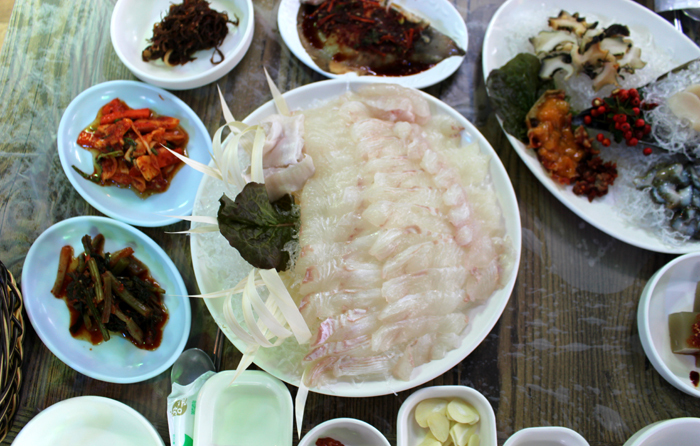 Fresh raw fish, other seafood and seafood stew add some culinary delight to a trip to Seonyudo Island.